The Meridian Poker Club in Belgrade continues with the Meridian Poker League of which, organizes the weekly and monthly tournaments. The Irish Open 2008 held in Dublin, has one of the biggest prize funds in Europe with an estimated prize fund of 2 million euros. The weekly tournaments take place every week and to participate is 1000 + 200 dinnars. In participating in the weekly tournaments, beside the cash prizes also points are accumulated, which gives the four best ranked players of that month to take part free at the monthly tournament. The monthly tournaments take place every first Saturday in the month. To participate is 5000 + 500 dinnars or by qualifying in the weekly tournament. 8 monthly tournaments will take place; and the chance to play free for the place at the Irish Open will be given to the ten best ranked players. - Only one re-buy (in the first two blinds) is allowed and every re-buy is counted as the new player. - For every win in the monthly tournaments, the player gets additional 500 points in the chips, which are added to the 8.000 guaranteed chips at the final tournament. On Saturday 1st December, at 19.30 at the new location in the Casino London, in Belgrade, the fifth qualifying tournaments for the Irish Open were held. There were 26 players, which was less than at the previous tournament, but in the first 20 minutes there were still 7 re-buys. The heads-up was played by two old acquaintances and experienced poker players Aljosa Mikovic and Dejan Ljubic. 75% of chips were in favour of Aljosa, Dejan did not pick the right moment, and so with 10-6 spades he moves all-in, Aljosa called with AQ, and the Ace hits on the river, and Aljosa Mikovic is the winner. After 5 qualifying tournaments, Filip Maksimovic leads the list in points. Beside the qualifications for the Irish Open, The Meridian Poker Club in Novi Sad offers to its players the tournaments with guaranteed prize funds of 100.000 dinnars. The last tournament was held on December 8th with the cooperation between yuPokerNews and the Meridian Casino. The yuPokerNews Free roll was held, where players had a chance to win 4 tickets for the Big Tournament 100K. All the tournaments in the Meridian Poker Club are in a great atmosphere, and its proving to be that Serbia has the open mindedness to poker, has good poker players and excellent tournaments organisers. The YuPokerNews Note: The next monthly tournament for the Irish Open will take place on January 5th, 2008. 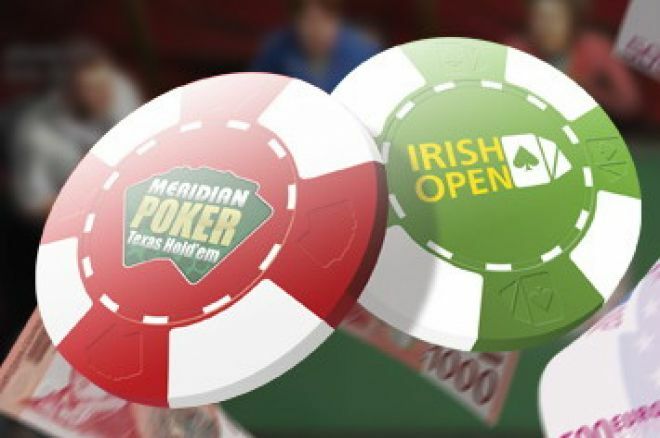 Visit the Meridian Poker Club; it is not too late to win the prize package for the Irish Open 2008!! !